Although traders had to consider the possibility that a pullback could occur after such a high-momentum rally earlier this month, if last week’s “downturn” was all the bears could throw at the stock market, bulls have to be pretty happy—at least for now. Even so, after three days of sluggish trading, stocks ended things on an up note, with all the major US indexes notching solid gains on Friday, and three of four closing out the week in the green. 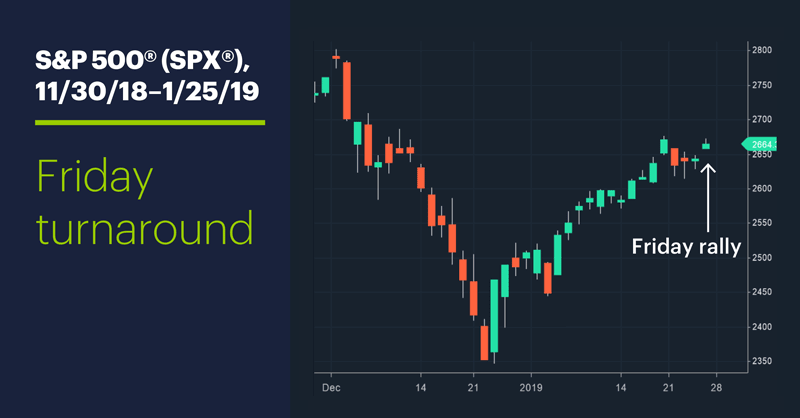 The S&P 500 (SPX) closed slightly down for the week, but still in the vicinity of its 2019 highs. Sector action: The top-performing S&P 500 sectors were real estate (+1.5%), information technology (+1%), and utilities (+0.4%). The worst-performing sectors were energy (-1.5%), consumer staples (-1.4%), and health care (-1.3%). Thursday also saw a surge in semiconductor stocks, paced by Xilinx’s (XLNX) 18% gain. On the downside, medical tech firm ResMed (RMD) took a -19% hit on Friday after missing revenue estimates. Futures watch: February gold (GCG9) uncorked its biggest up day of the year on Friday, rallying more than 1.5% to around $1,300/ounce. It was a quiet week for oil, with March WTI crude futures (CLH9) dropping modestly on the week to around $53.60/barrel. With another Brexit vote looming, March British pound futures (6BH9) start this week at their highest level since early November after pushing above 1.3200 on Friday. ●Monday: Caterpillar (CAT), Royal Caribbean (RCL), Celanese (CE). ●Tuesday: 3M (MMM), Allergan (AGN), Biogen (BIIB), First Bancorp (FBP), L3 Technologies (LLL), Lockheed Martin (LMT), Pfizer (PFE), Rockwell Automation (ROK), Verizon (VZ), Xerox (XRX), Advanced Micro (AMD), Amgen (AMGN), Apple (AAPL), eBay (EBAY), Juniper Networks (JNPR). ●Wednesday: Alibaba (BABA), AT&T (T), Boeing (BA), Check Point Software (CHKP), General Dynamics (GD), McDonald's (MCD), NASDAQ (NDAQ), Cree (CREE), Facebook (FB), Microsoft (MSFT), Mondelez Int'l (MDLZ), PayPal (PYPL), Qorvo (QRVO), Qualcomm (QCOM), Tesla (TSLA), U.S. Steel (X), Visa (V), Wynn Resorts (WYNN). ●Thursday: Altria (MO), Baker Hughes (BHGE), Baxter (BAX), Celgene (CELG), ConocoPhillips (COP), DowDuPont (DWDP), General Electric (GE), Hershey Foods (HSY), MasterCard (MA), Northrop Grumman (NOC), Raytheon (RTN), UPS (UPS), USG (USG), Amazon (AMZN), Cypress Semi (CY), Edwards Lifesciences (EW), Mattel (MAT), Symantec (SYMC). ●Friday: Chevron (CVX), CIGNA (CI), Dominion Energy (D), Exxon Mobil (XOM), Honda Motor (HMC), Merck (MRK), Sony (SNE), Spirit Aerosystems (SPR), Weyerhaeuser (WY). ●Monday:Chicago Fed National Activity Index. ●Tuesday: UK Parliament votes on Brexit Plan B, FOMC Meeting starts, S&P Corelogic Case-Shiller HPI, Consumer Confidence, International Trade in Goods, Retail Inventories, Wholesale Inventories. ●Wednesday: GDP, ADP Employment Report, Pending Home Sales Index, FOMC Meeting Announcement. ●Thursday: European Union Unemployment Rate, Personal Income and Outlays, Employment Cost Index, China PMI Manufacturing Index. ●Friday: Employment report, PMI Manufacturing Index, ISM Manufacturing Index,Construction Spending, Consumer Sentiment, Germany PMI Manufacturing Index, European Union PMI Manufacturing Index. Rally check. The S&P 500’s (SPX) year-to-date return as of Friday—the 17th trading day of the year—was 6.3%. Although that’s down slightly from last week, it’s still higher than the 17-day return for all but four other years since 1950, placing it at the 95th percentile. 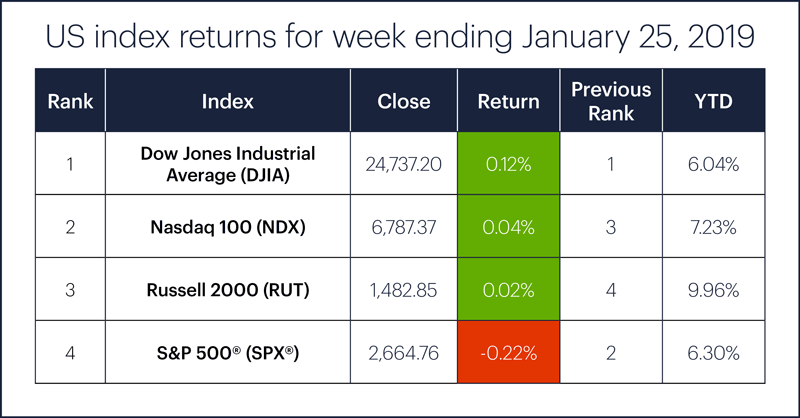 It was the seventh consecutive day the SPX’s YTD return was above the 90th percentile—just two days shy of the index’s run last January. 1 Bloomberg.com: Wilbur Ross Says U.S., China ‘Miles and Miles’ From Resolving Trade War. 1/24/19. 2 MarketWatch.com. ‘It’s extremely negative’ if shutdown lasts much longer: Morgan Stanley CEO. 1/24/19. 3 CNBC.com. PG&E shares spike 70% after California investigators clear utility of blame for a 2017 fire. 1/24/19.